Discover why Havana in Cuba ranked #86 in our countdown of ‘100 Most Incredible Cities in the World’. Until recently the capital of Cuba has been largely closed off to the world with America’s 50-year-old embargo. This has also meant the rich and compelling culture of the Caribbean city has been absolutely preserved, to the point where it’s almost stuck in a ’50s timewarp. Its eclectic (and somewhat ramshackle) architecture spans 600 years mixing all sorts of styles such as Moorish, Baroque, Art Deco and Neoclassical; pre-Cuban Revolution cars such as Buicks and Chevrolets line the streets; and locals are dressed in styles from traditional Cuban to Afro Cuban to 1950s-style western to modern western. 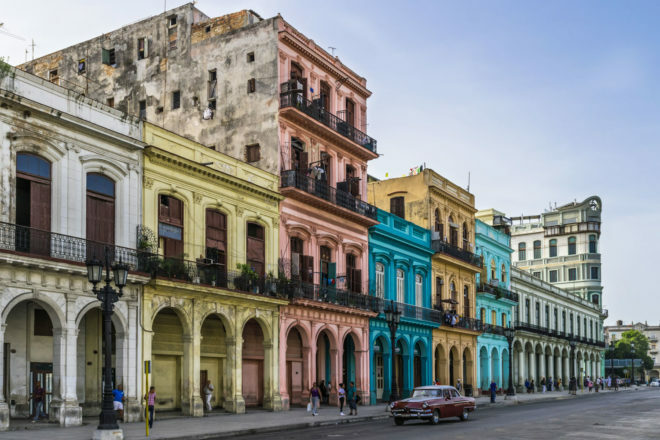 Havana’s UNESCO World Heritage-listed Old Town is an absolute must-do but there’s plenty more to this city, such as a day on the gorgeous palm-fringed beach Playas del Este or a wander along the Malecón, the city’s eight-kilometre seaside drive, best done at sunset.